This is a brief review of a podcast from the American Counselors Association (ACA). The ACA provides podcasts wherein they interview key professionals and specialists. This particular podcast was aired on February 8, 2009 with speaker Dr. Howard Kirschenbaum regarding the esteemed Carl Rogers. 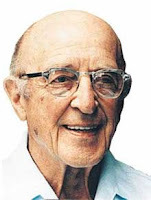 Carl Rogers was the developer of person-centered therapy which is now one of the front-running therapeutic philosophical approaches worldwide. Below you will find a few notes I took and a brief summary (some verbatim) of the podcast, as well as the URL where one can listen to the podcast. I recommend it! Speaker Dr. Howard Kirschenbaum is the author of The Life and Work of Carl Rogers . He is Professor Emeritus and former chair of Counseling and Human Development at the Warner Graduate School of Education at the University of Rochester, in New York. Dr. Kirschenbaum is the author of more than 20 books on education, counseling, and history. Dr. Kirschenbaum first talks about some of the personal issues that Carl Rogers had. Carl Rogers struggled with alcohol dependency for the last few decades of his life. It is one of several areas that show him as a more dynamic and “human” individual. The counselor serves as a helpful and supportive person to enable the client to do their own work. The client is their own expert. Before Rogers, the therapist was the expert on the client. Rogers’ approach was “revolutionary.” Each person can arrive at their own answer. Rogers never said that human beings were inherently good. He said that they are basically trustworthy when provided with the positive conditions for growth and self-actualization. Negative conditions bring about a warped individual. They will do what they must to meet their needs, even if done in a warped manner. Rogers was optimistic that if nurturing conditions were provided, a client would grow. Person-centered approach is less of a theory and more of a philosophical means of being a therapist (in the U.S.). In other countries, it is the leading means of therapy. It is taught as a distinct approach and is empirically supported. To learn more, listen to the full podcast.